Nation branding has been criticised for leading to the homogenisation and depoliticisation of national interest and identity. 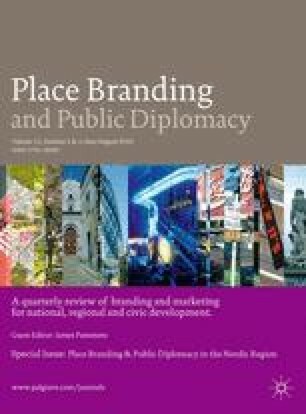 This study examines the politics of nation branding in relation to its configuration with public diplomacy and the institutional policy context in which they are embedded. Informed by Scandinavian institutionalism and the analytical concept of translation, the study reveals that the way that nation branding relates to public diplomacy within an institutional context sets the frame for its politicisation. Translation enables the understanding of nation branding as a dynamic process of becoming that unfolds in relation to time and place. The research contributes to a more nuanced view on nation branding in presenting its toolbox practices as less determined by a corporate marketing logic. Despite the uniformity that allegedly characterises nation branding practices, the processes by which nation branding initiatives are implemented in Scandinavia are found to differ profoundly. Billger, O. (2006) Laila Freivalds avgår. Svenska Dagbladet, http://www.svd.se/nyheter/inrikes/laila-freivalds-avgar_302444.svd, accessed 21 March 2006. Croneman, J. (2015) Det svaga stödet för Lars Vilks beror delvis på ett aggressivt Kultursverige. Dagens Nyheter, http://www.dn.se/kultur-noje/kronikor/johan-croneman-det-svaga-stodet-for-lars-vilks-beror-delvis-pa-ett-aggressivt-kultursverige/, accessed 17 February 2015. Danish Broadcasting Cooperation. (2013) Per Stig Møller og Muhammedkrisen [Per Stig Møller and the Cartoon Affair, https://www.dr.dk/tv/se/per-stig-moeller/per-stig-moeller-om-krig-fred-og-muhammedkrise-1-3, accessed 3 March 2013. El Mahdi, J. (2007) Reinfeldt och fredsagenterna parerade Vilks-krisen briljant, Svenska Dagbladet, http://www.svd.se/nyheter/inrikes/reinfeldt-och-fredsagenterna-parerade-vilks-krisen-briljant_289062.svd, accessed 7 October 2007. Holender, R., Svahn, C. (2006) Muhammedteckningar borta efter Säposamtal. Dagens Nyheter, http://www.dn.se/nyheter/sverige/muhammedteckningar-borta-efter-saposamtal/, accessed 10 February 2006. Karnborg, U. (2010) Lars Vilks röjer en svensk konsenus kultur. Dagens Nyheter, http://www.dn.se/kultur-noje/kronikor/ulrika-karnborg-lars-vilks-rojer-en-svensk-konsensuskultur/, accessed 25 March 2010. Lending, M. (2000) Oppbrudd og fornyelse Norsk utenrikskulturell politikk 2001-2005 (January 2000), https://www.regjeringen.no/nb/dokumenter/oppbrudd-og-fornyelse/id105583/, accessed 25 March 2015. Letter from ambassadors. Letter to Danish prime minister Anders Fogh Rasmussen from 11 ambassadors, http://danmarkshistorien.dk/leksikon-og-kilder/vis/materiale/brev-fra-11-ambassadoerer-til-statsministeranders-fogh-rasmussen-samt-anders-fogh-rasmussens-svar/ accessed 12 October 2005. Magnusson, E. (2006) Freivalds avvärjde svensk Mohammed kris. Sydsvenska Dagbladet, http://www.sydsvenskan.se/sverige/freivalds-avvarjde-svensk-muhammedkris/ 23 October 2006. Ministry of Foreign Affairs of Sweden. (2006) Public announcement by Laila Freivalds, http://www.regeringen.se/content/1/c6/07/61/49/5566210b.pdf, accessed February 2006. Ministry of Foreign Affairs of Sweden. (2007) Sweden in foreign news media (August-September 2007), http://www.regeringen.se/sb/d/8898/a/91567, accessed 20 February 2015. Ministry of Foreign Affairs of Sweden. (2015) The council for the promotion of Sweden abroad. [Nämnden för Sverigefrämjande i utlandet], http://www.regeringen.se/sb/d/3028/a/146544, accessed 20 February 2015. Rasmusson, A.F. (2005) Response letter to the 11 ambassadors by Danish Prime Minister Anders Fogh Rasmussen, http://danmarkshistorien.dk/leksikon-og-kilder/vis/materiale/brev-fra-11-ambassadoerer-til-statsminister-anders-foghrasmussen-samt-anders-fogh-rasmussens-svar/ accessed 21 October 2005. Swedish Institute (2012) Progressive communication in practice: successful projects, engaging stories, and succinct messages, https://si.se/wp-content/uploads/2012/12/Progressiv-kommunikation-i-praktiken.pdf. Swedish Institute website. (2015), https://eng.si.se/about-si/ accessed 28 September 2015. TimesOnline (2006, February 15th) 70,000 gather for violent Pakistan cartoons protest, http://www.timesonline.co.uk/tol/news/world/asia/article731005.ece, accessed 7 February 2010.